We are living in the End times when deception is rampant, even in the Church. The writers of the New Testament warned of false prophets arising in the midst of the Church at this time, even as in the Early Church. Jesus also said that in these times, there would be many false christs who would deceive many. Even now, there are at least seven noted ones in the world claiming to be Christ. We need to be aware of this danger; too many in the Church are asleep. God wants us to desire, recognize, and know the true anointing of His Holy Spirit so that we might stand strong in Him, free from deception. 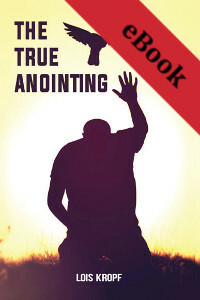 We trust that this book will help you to understand the true anointing, and to draw you nearer to the Anointed One of God so that you will flow as one with the Spirit of God. Lois Kropf is currently a missionary serving in Malawi and Tanzania, Africa, under Zion Fellowship International. She and her husband have been actively involved in running a Bible school and an NGO assisting over 2000 orphans. She has ministered extensively in several countries in Africa and in the United States, teaching in Bible schools, ladies and pastors seminars.